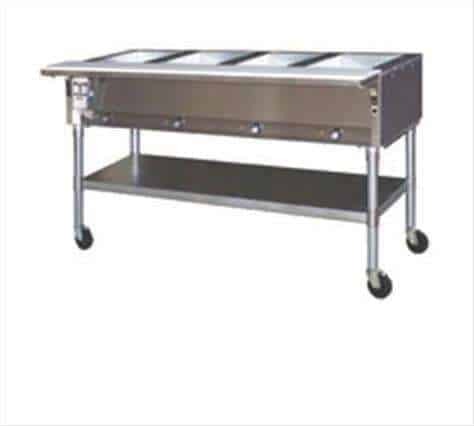 Eagle Hot Food Tables, open base design, model SPDHT3-208. Top and body to be heavy gauge type 430 stainless steel. Beaded top openings to be 123 ⁄32˝ x 203 ⁄32˝. Heating compartments to be 8˝-deep, galvanized, and insulated on all four sides and bottom with 1˝ fiberglass or equal. Recessed control panel with individual infinite controls offer high and low settings. Each compartment fitted with 500-watt heating element for 120-volt units, and 750-watt heating element for 240-volt units. Six foot cord and plug extends from the bottom right hand side of the unit. Furnished with polycarbonate cutting board. Legs to be 15 ⁄8˝ O.D. tubing, with adjustable undershelf and 4˝-diameter casters.